Odder, Denmark – February 11, 2019 – At this year’s LIGNA, System TM’s booth will be brimming with cutting edge technologies and machine-to-machine integration. An Opti-Solution manufacturing line will be showcased in full operation with an array of machines and options from both System TM and its scanner partner, MiCROTEC. Showcasing this Opti-Solution will demonstrate System TM’s ever-growing expertise in optimizing staff and wood resources, as well as the customer benefits that emerge from a close System TM-MiCROTEC partnership – a partnership that continues to reach new heights. “Our attendance at LIGNA 2019 underscores our dedication to helping companies optimize their production by maximizing lumber utilization and production capacity, and minimizing labor costs,” says Per Jørgensen, CSO of System TM. A leading expert in designing and developing customized solutions, System TM will not only be showcasing the Opti-Solution to demonstrate its expertise in optimizing staff and wood resources, but also to demonstrate its expertise in integrating hardware and software between all functions of a manufacturing line. ‘‘We want to show our guests how integrating our machinery with MiCROTEC’s machinery adds significant value to production processes and increases productivity and efficiency’’, says Per Jørgensen. At LIGNA 2019, System TM will be presenting leading, powerful machinery marked by high artificial intelligence (Industry 4.0), in which decisions and tasks are carried out with the least amount of human involvement possible. Thanks to the intelligence of System TM’s software and hardware, error prevention is automatically performed in the event of operator error, workpiece condition errors, or machine errors. This way, errors are automatically resolved before they occur or cause machine downtime. Industry 4.0 will continue to define the future for System TM, as machines are designed with less need for human intervention to minimize human error, and with more self-regulation to uphold the highest levels of manufacturing efficiency and uptime. – Watch how staff and wood resources are optimized: high production capacity, maximum lumber utilization, maximum uptime and no need for manpower. – See how hardware and software is fully integrated between all functions of this line. – See the process of workpiece optimization through the cooperative interaction between the scanning measuring devices and the mechanical machines in this line, such that the output of one becomes the input of the other. – Examine the scanner’s ability to detect defects by visually inspecting its detection and optimization results after workpieces have been scanned. – Get a detailed look at the System TM – MiCROTEC optimizing software. – See the exceptional production capacity of the optimizing Opti-Kap 5103 cross cut saw. – Collects and analyzes performance data from each machine unit, allowing users to analyze crucial data from their line in order to adjust their line and achieve best overall equipment performance. – Watch a simulation of an actual cross-cut line’s production uptime, production stops and lumber utilization which will be displayed on a scoreboard. LIGNA is the world’s leading trade fair for woodworking and wood processing plant, machinery and tools. 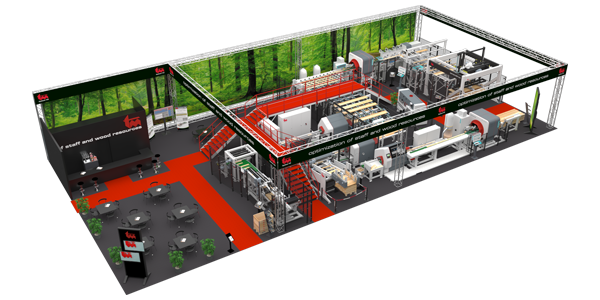 LIGNA 2019 will be held on Monday, May 27 to Friday, May 31, 2019 at Hannover Exhibition Center in Hannover, Germany. The System TM sales team is excited to be exhibiting at LIGNA once again. Visit stand D28 in exhibit hall 27 to learn more about System TM’s products. System TM is a leading global supplier of customized solutions to the solid wood industry with more than 40 years of experience and countless running lines worldwide. Headquartered in Odder, Denmark, System TM’s success is based on its continuous product development and the technical expertise of its employees who possess broad skillsets in design, installation, commissioning and training, service and maintenance.